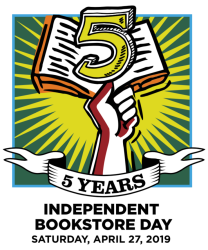 We are looking forward to celebrating the 5th anniversary of Independent Bookstore Day on Saturday, April 27th. Come in to the bookstore for spring-themed children’s storytime with activities and coloring, storewide scavenger hunt for grownups, snacks and drinks while you choose a Blind Date with a Book, and bring in your dog for a treat and a photo. Your dog will be a #dogsofinstagram celebrity! We also have a lot of author events this month including: some of the contributors to Yes She Can, Paul Di Filippo, Martha Nussbaum, and more. Read our newsletter online or pick one up in the bookstore.